Increase your lightweight camping options with our DD SuperLight Tents. 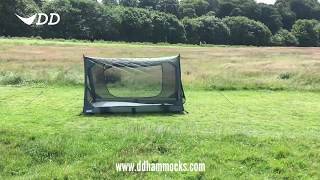 The DD SuperLight A-Frame Mesh Tent is a great solution when travelling or for minimal backpacking. Designed to be propped up at either end using hiking poles, this tent fits into one small bag - and at just 730g (excluding pegs/guys) it won't weigh you down! The DD SuperLight A-Frame Mesh Tent is spacious enough for 2 campers plus a rucksack. Used with a tarp for shelter, this tent is spacious enough for 2 campers plus a rucksack and is ideal for camping anywhere - from woodland to hilltop to beach to moorland environments. 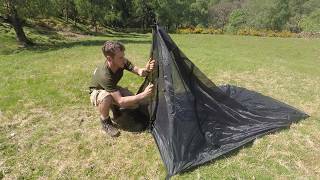 If you’re using it without a shelter, its ultra-fine netting is great protection from insects (including Scottish midges)! Note: 2 x hiking poles required for set-up (not included). DD Hiking Poles recommended. We do not recommend fires of any kind within our tents.